Washington’s Pac-12 tournament aspirations ended in a single night, as the Ducks frequently doubled up on scoring star Kelsey Plum, including the final shot, in sixth-seeded Oregon’s 70-69 upset. A freshman came up big for the Ducks and a senior fell short for the Huskies in the final seconds Friday as Oregon upset third-seeded and 11th-ranked Washington in the quarterfinals of the Pac-12 Conference women’s basketball tournament at KeyArena, 70-69 (box). Sabrina Ionescu drained a pair of free throws to put Oregon on top and Kelsey Plum missed a last-second three-pointer as Washington made an early exit from the conference tournament in front of a tournament-record 9,686. With Washington (27-5) leading 69-68 with 0:50 to play, the Huskies won a dead-ball rebound in their offensive end. But Freshman Aarion McDonald was whistled for a moving screen on the ensuing play, then was called for tripping Ionescu with seven seconds remaining, putting the Ducks in the bonus. Ionescu, a freshman guard from Walnut Creek, CA, stepped up and drained both. Her confidence was absolute. 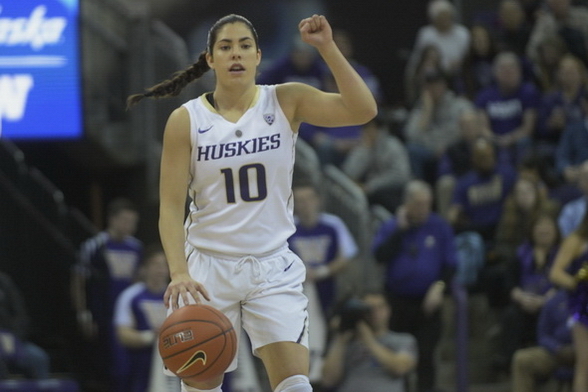 Washington coach Mike Neighbors took a timeout, and the Huskies naturally put the ball in the hands of Plum, the nation’s leading scorer. She came topside around a screen and jumped, two defenders in her face, before misfiring a three that fell well short of the hoop as the buzzer sounded. The drama capped a late push by Oregon to overcome a 60-51 deficit early in the fourth quarter. Oregon guard Lexi Bando hit two threes as the Ducks closed in. Bando, who scored nine points in 35 minutes in a 99-77 Washington victory Dec. 30, finished 9-of-16 from the floor and five-of-seven from three-point range for a team-high 23 points. Neighbors never felt comfortable, even as his team threatened to pull away. “This team’s too explosive,” Neighbors said of Oregon (20-12). “I was happy that we were playing well but by no means were we satisfied or think there wasn’t another run coming. They’re too good a team. They hit some very timely shots and that was the big difference. Ionescu finished with 18 points, Ruthy Hebard had 13 and Cazorla 12. The Huskies were led by 34 from Plum, who became the third player in NCAA history to score more than 1,000 points in a single season, after banking a layup off the glass in the third quarter. Despite Plum’s high-scoring night, she went two-of-nine on three-point attempts, well below her season average of 43.6 percent. Osahor, meanwhile, had a tournament-record 27 rebounds as part of a double-double in which she scored 12 points. McDonald had 10 points. The loss highlighted Washington’s weakness and primary cause for concern ahead of the NCAA tournament: Lack of depth. Late in the game, passing on offense was merely a formality, as all 10 players knew the ball would end up in Plum’s hands. Other Washington players looked almost nervous to take a shot. Oregon coach Kelly Graves detailed the plan for trying to slow down Plum. “You can’t defend her with just one,” Graves said. “There was always help lurking. We switched off a lot. We went with a guard on Osahor, so any time those two were involved in a pick-and-roll we switched it. Sabrina was involved in a lot of those. Every time she drove you had to have someone lurking around the hoop. Despite record-breaking nights from Plum, Osahor and the crowd, it was clear that the Huskies will have legitimate concerns about making another deep push in the NCAA tournament, now made more difficult by an impending drop in the rankings. Moving screen call one of several the refs blew, too bad they decided the game. I’d say Oregon decided it. Down by 2 with time on the clock with the nations highest scoring GUARD on your team? The ONLY play is to DRIVE to the hoop: You make the shot, you get FOULED and go to the line or you miss. It’s the only play to run, period. They double-teamed her inside four seconds, knowing she wouldn’t give it up. Needed someone else to be a hero. In terms of the NCAA tournament, this is a non-event. But it may have been the Huskies’ mlast chance to beat Oregon for a few years. The Ducks are young and good now, and maybe untouchable next year. The Huskies are losing four seniors, including three starters, one of whom is a once-a-generation player. So, yes, enjoy the moments.